A security guard stops photographers from entering a resort. 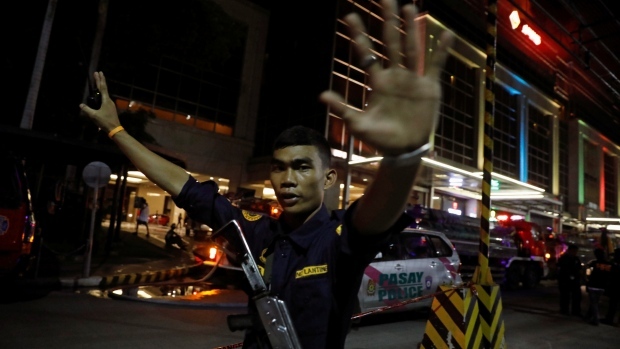 On Friday explosions were heard on an entertainment resort in the capital Manila, Philippines. The military is currently monitoring the situation for as long as possible. A Philippines military spokesperson Restituto Padilla said that police are in full control of the situation. Explosions and gunshots were heard within the resort’s complex. Local media reported that there were armed men inside the complex. There was also a fire on the second floor of the Resorts World Manila building. Said Ian Manalo, a Fire Protection Bureau spokesperson. The resort mentioned on social media that it was on lockdown and police were in control of the entire situation. "We ask for your prayers during these difficult times," the resort said on Twitter. Witnesses spoke to radio stations and said that there were several gunmen seen inside the complex. The information could not be immediately verified but according to News Channel ANC claimed that there was two gunman wearing masks and black clothes. Reports indicate that there was an injured SWAT member who rushed toward the scene but was shot at by unidentified men. Pictures on social media indicate that there was a large cloud of smoke coming out of one of the buildings. A United States terrorism monitor group known as SITE Intelligence said there was an ISIS-linked Filipino and who had daily updates on the situation in Malawi claims that “lone wolf soldiers” of ISIS are responsible for the attack at the Resorts World Manila. An English version of the message was distributed in several pro-ISIS chat groups SITE said. SITE says the ISIS-linked operative wrote "The lone wolf soldiers of Khilafah attack the heart of Kufar the city of Manila in Resort World." The resort is popular with tourists since its opening in 2009. It also has several hotels and at least three under construction and is right across from Manila’s international airport. It even has a shopping mall and performing arts theater.